Pre-orders for the YotaPhone 2 began in late November 2014. Russia’s first smartphone is being geared towards the Chinese market. However, it is not the only gadget that may be of interest to foreign customers in the near future. 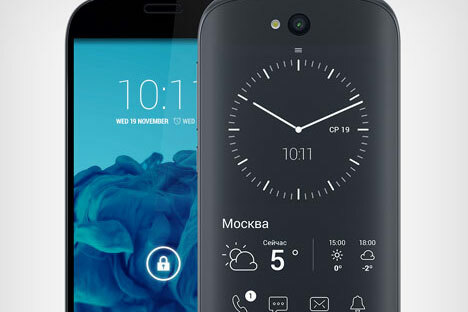 No other gadget, not even the iPhone, has had a promotion campaign quite like the Russian YotaPhone 2. At the APEC summit, which was held in Beijing in early November 2014, President of Russia Vladimir Putin presented a YotaPhone 2, which has not yet been released, to Chinese leader Xi Jinping. The new “Russian smartphone” is the world’s only mobile gadget with two screens, one of which runs on e-ink, ensuring that the screen remains elucidated even when the battery is drained. The phone is available for pre-order on the official website of its manufacturer, Yota Devices. The official launch will be held in Moscow on Dec 2. YotaPhone 2 is not the only notable Russian gadget available on the market. There are many other portable devices, although many of them could hardly be described as technological breakthroughs. However, these Russian gadgets offer good value for the money, which could allow them to compete successfully on the world market. RBTH looks at the most promising of these gadgets. If we are going to engage in a serious discussion about Russian gadgets, it would be impossible to omit the RoverComputers company, which has been making portable devices in Russia for nearly 20 years. In early 2014, the company began upgrading its product range. RoverComputers makes different devices ranging from tablets to dashboard cameras. The RoverPad Air tablet deserves particular mention. On the one hand, this device with its quad-core processor is unlikely to surprise anyone. Its standard features like Bluetooth, GPS, Wi-Fi, a 10” display and two cameras, are hardly unique. But the price tag on this gadget is far below its competition. RoverComputers manages to make a decent middle-range tablet, costing 33 on average percent less than its market equivalents. The teXet company might not have invented the watch, but it has done something that other companies have been dreaming of for a long time. Its new product is a smartwatch, X-Watch, which helps in the operation of a smartphone. The smartwatch range includes three models of varying complexity and usability. The most basic model, the TW-120, has a Bluetooth module to pick up any notifications that a smartphone received by email, through social networks or by text. Despite its superpowers, the X-Watch looks just like an ordinary watch. But it is also waterproof, so you can be alerted of new emails even while taking a shower. The TW-200 model has more functions. Its 1.5” display has an electronic watch, a calculator, a virtual keyboard and can receive all notifications from a smartphone. The watch has a speaker and a microphone built in, so calls can be answered without engaging a handset. Finally, the smartest watch of them all is the TW-300. In effect it is a mini Android 4.3 computer with a dual-core processor and 4Gb RAM. Therefore, it has many applications capable of replacing a smartphone. But the small display probably will keep smartphones from going out of business any time soon. For a long time, the bb-mobile company was just a distributor, but now it makes portable devices under its brand as well. In addition to standard smartphones and tablets, its product range includes a very useful device called bb-mobile VOIIS GPS. The bb-mobile VOIIS GPS is a phone that allows its owner to remotely control the phone of a relative undergoing medical treatment. It will remind them to take their pills and can measure and store readings of many vital parameters, such as blood sugar level or blood pressure. The SOS-function is supplemented with a service that monitors a user’s location. In short, it is an ideal device for elderly people and their families. Its equivalents are already available on the world market. However, the Russian version is priced very competitively, so it may become a popular option to customers outside of Russia. The Russian company Highscreen began by designing laptops and tablet computers. Since it entered the Russian market in 2009 it has been working with more advanced technologies. It is responsible for the world’s first dual-display Android smartphone (Highscreen PP5420) and Russia’s first Android smartphone with a QWERTY keyboard (Highscreen Zeus). At first, the company was only a distributor. However, in 2012, it developed its own models, which could be of interest to consumers on the world market. In 2013 the company released its Highscreen Boost 2 smartphones with a previously unthinkable battery life of up to two weeks. The secret to its success is that the device has two external battery packs, with 3,000 and 6,000 mAh battery capacities respectively.